Staff Selection Commission (SSC) has released notification for Combined Graduate Level Examination, 2017. A written exam will be conducted for selecting candidates for filling up several posts in various department. The written exam will be held on 01 August 2017 to 20 August 2017 (For Tier I). Interested Candidates may apply latest by 16 June 2017. 1 Assistant Audit Officer Indian Audit & Accounts Department under CAG Pay Band –II Rs.9300-34800 (GP – 4800) 30 years. 2 Assistant Accounts Officer Indian Audit & Accounts Department under CAG Pay Band –II Rs.9300-34800 (GP – 4800) 30 years. 1) For Assistant Audit Officer : Candidate must have done Bachelor’s Degree from a recognized University or Institute. 2) For Statistical Officer Grade – II : Candidate must have done Bachelor’s Degree in any subject from a recognized University or Institute with at least 60% in Mathematics at 12th standard level. 3) For All other Posts : Candidate must have done Bachelor’s Degree from a recognized University or equivalent. Selection of candidate is based on written exam Tier-I & Tier-II, Physical Test and merit list. A written exam will be held under Combined Graduate Level Examination, 2017 (Tier-I) on 01 August 2017 to 20 August 2017. OR 2.00 P.M. to 4.00 P.M. Interested candidates are requested to apply online for the SSC-CGL 2017 Examination through the official website www.ssc.nic.in. Rgistration will be done in two phase – Part-I & Part-II. Candidates are requested to fill online form on before 16 June 2017. 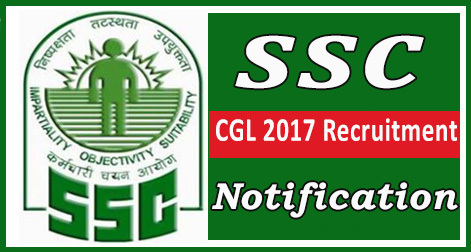 Help us to improve this article/job posting "SSC CGL (Combined Graduate Level) 2017 Notification". We would be glad if you can comment below and provide your valuable suggestions and feedback. If this page have any wrong information/list or out of context content, then you can report us as well. my result is awaited of b.sc third year. Can i apply for ssc cgl 2015?